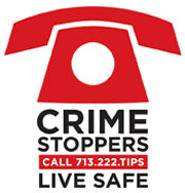 Crime Stoppers and the Houston Police Department’s Robbery Division need the public's assistance identifying the suspects responsible for an aggravated robbery with a deadly weapon. Suspect #1: Black male, young, thin build, gray hoodie, yellow gloves, black pants and black shoes. Suspect #2: Black male, young, medium build, dark hoodie, dark pants and white shoes.